with correct PCD, For the new wheels. 8mm clearance actually. Because... they make 145 50 tyres to replace these 130 60 tyres... I intend getting a set one day. 1mm clearance! They are available in the us, but not in the eu. No idea why. Does anyone know ANY logical reasons for the "WHY" of any damned thing in the EU. Apart from its all obvious ambition to crush every European state in its insatiable maw? Nope! In this case nobody has imported any. Yet. Maxxis tyres also do kevlar reinforced puncture proof, and available in the us? As do carlisle tyres I think. That sealer is Off Road, OKO. And on tubeless tyres you literally cannot deflate them with a drill... The Kevlar (K Shield) is just another precaution. If the manufacturers moved to properly constructed tubeless tyres, with some sealer in, punctures that lead to deflation would be a thing of the past. I am curious; How does the lose shield work inside a tubeless tire, without something to maintain its inside the outside tire diameter position? I can see how it might/will help inside a tubed tire, the tube holds it in place against the outside of the tire, and the shield keeps a nail or thorn from getting to the tube and creating a puncture. 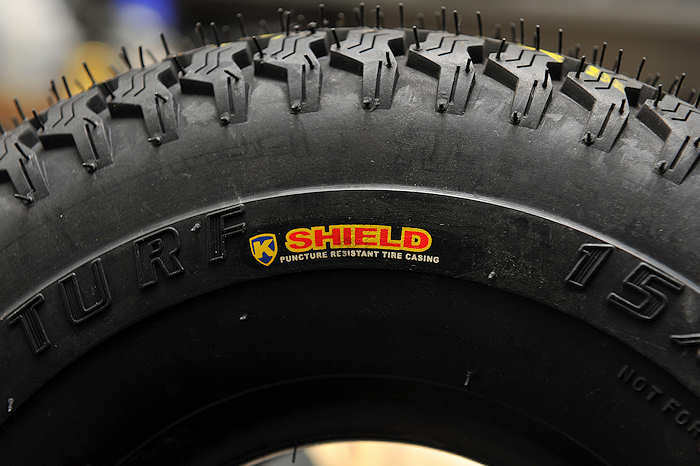 Just how does that shield help in a tubeless tire? Its not loose. Its built into the carcase. If you try and stab a hole in one with a pointy screwdriver for eg, it just wont go in. A drill does, but even that's harder than you would expect. No way a nail or glass would go through easily. And if it does, it holds the rubber tight together. So it doesn't leak in any case! Its in the sides too. I was thinking you meant a seperate shield that is often advertized with tires. I do understand the tires shown and why as well as how they would work. They are 99.9% fail proof. Well worth the money asked for them. Add the GOOP and it can only enhance the flat protection, I get it. I tried to make a set of rubber gasket seals for a set of tires I experimented with. But without adding the sealer the air leaked out in a few hours. I sort of feared to add the sealer, thinking I was only giong to make more of a mess that I already have. For a split non tubless wheel, but tubeless tires, the bead set very hard even with a good soapy lubricant. So bead set didn't concern me.. The split is the issue. I didn't know you did this and with success at that. When drag racing bikes, very often 3 piece split rims are used. These are car rims, with home made solid billet centres. These are used on bikes doing 240mph plus with 500 to 1000 horsepower. The three parts are assembled with a tubeless tyre, and only clear silicone "bath" (tub?) sealer is used. A thin, bead, assembled wet, allowed to cure for 2 days before inflating. That's the normal way of assembling wheels if no rubber ring seal in included. EXCELLENT !!!! I will give that a go. Thanks. My solution, not really recommended if you can fit something like the Hegar rims, was to seal the two halved together with a hybrid sealant - somewhat like a silicone, but more tenacious, paintable and durable. Sticks tightly, but can be cut apart with a knife. The sealant was allowed to partially cure, then the wheel halves were bolted together with four 4mm flat head cap screws and nuts, then attached to the hub with four mm flat head cap screws, so there's lots of clamping force. Not pretty like the Hegars, but those spun aluminum wheels will not fit over the gearcase nose of the MicroMotor in-line motors, while the cheap stamped steel ones will. P.S. My first attempt was to use O rings inside and outside the bolt circles with cast urethane between the two - didn't work worth a d--n. With the Hegars you can use their machined aluminum + O-ring device, but I think the steel wheels are much too irregular to use anything except cure in place. For those following this, the BM2 ends up at a fraction under 25 inches with those fat tyres, and with 7mm of running clearance between tyres and centre section. That's 130 tyre, 7mm gap, 90mm motor, 175 wide centre section, and then another 90, 7, and 130mm. 629mm or 24.76mm overall tyre edge to tyre edge. It could be 12mm narrower (half inch) , but I allowed 7mm clearance room to add the 145 wide and even lower profile tyres at a later date if needed. If you do the maths, it means that I could build a narrow powerchair for a small person, child, that used stock powerchair 3 inch wide x 14 diameter tyres, and with full group 24 batteries, and still end up just 20 inches wide!!! And 37 long inc footplates/anti tips. Just so you know, I am very thankful for my carers. I wouldn't be able to do any of this without a bit of volunteered help. Everything I touch falls on the floor. Everything I need is out of reach, too heavy, and not wheelchair friendly. And I cant clear up either. Too much spasm, and most of the time wasted running over things I have dropped or need to carry on. All I can say is its a good job I don't try to make a living doing this! I would send myself bankrupt. These simple wheel adapters took me about a week. I spend more time in the loo, or trapped running over stuff, or stuck because I cant do something than I ever do being productive. So it will forever remain a very slow hobby. People harass me to build them powerchairs and they just don't get it... Its simply not possible. Here's the state of my room after tonight. Even my bed is covered in swarf, and the floor, my tilt table, towels, and most of my tools/bolts/parts are all out of reach on the floor... Its so damned frustrating. But finally I have my wheel spacers done! And my drill works! This is a 3 bolt wheel adapter (made originally for the cheap quad bike 145/70-6 wheel rims). Its an old pully, machined down, and has a taperlock centre. 3x skate wheel 8mm bore 10mm wide spacers. And an 8mm laser cut disk of 120mm diameter ordered online. This alloy disk is drilled and countersunk for M8 bolts, to attach to the taperlock, with 3x M8 high tensile countersunk bolts to leave a flat finish. Its also drilled to suit the alloy Monkey bike rims. So has 4x M8 tapped holes in the correct places for the wheel. Its shown here sideways, attached to the taperlock pulley. And shown sat on the bench with another 8mm 120mm disk, that is the cover that will be seen on the wheel centre. So it will be polished to a mirror finish. On the wheel, but not yet polished up! This took a LOT of extremely accurate marking out, and drilling, tapping, and countersinking. But is a perfect fit. The same approach will allow anyone to fit any 6, 8, or 10 inch rim to almost any chair. And you can do it in a bedroom as long as you can get a volunteer and delegate no matter how disabled you are. No reason to have hard, battery wasting solid tyres, or tubes. Fit tubeless! Looking good (your machine work ) not your bedroom . I can certainly relate to the slow going on getting stuff done. That's why I have many multiple projects of differing diciplines going at the same time. When one comes to a halt, or I get frustrated, I just shift to another. It's a good feeling when I complete one! It frustrates me when I cant! And I make so much mess that I cannot have lots of projects going at once. No space. What i like about you is when you do anything. Its always first class jobs. If you do it.Do it right, First time every time. Thats the most frustrating thing for us all i think. One big waiting game. Its always first class jobs. Because if you cant do a better job than the manufacturer, why bother? They have the advantage of proper workshops, teams of experts, outside suppliers/machine shops that make complex parts to order, and a production line. And have the luxury of a development time/budget to problem solve. Mine has to be better because I get just one go. Must look, and work right from the start. Or it wont end well... A few tiny errors or problems will end up with a chair thats not as good as a bought one. And you will wonder why you bothered and regret ever trying. And you dont see the parts I screwed up, drilled fracionally wrong, or that ended up needing a redesign. And is just practise and a grasp of whats available / possible and of materials. I made and saw a lot of stuff when building/racing drag bikes, nitrous systems, rolling roads, in my own businesses, fitting kitchens, bathrooms for my dads business, and in various hobbies. And hobby stuff like building model planes, steam engines, miniature gas turbines/pulse jets etc. Its a lifetime of messing about with mechanical/electrical stuff. It lets you see how stuff goes together. And think of similar solutions with the least work, best solution. But now as you say, I know how, have the knowledge but need 3 helpers to drill a hole! for eg is an overweight bodge to fit a wheel. Its strong and it works. But a single manufactured hub purpose built from 1 part would be better. But I dont have the required machine shop... So its a solution but not the best solution. Using loctite on hub wheel/screws.Or just correct torque for right Cap screws. Not bad for 130mm (5.25 inch wide tyres) with full sized Group 24, or 34, batteries... (Or lithium in mine obviously). And a TOTAL length of 40 inches inc a deep footplate and anti tips. The advantage of siting batteries north/south! from a UK supplier or imported in.? Don't remember where... Maybe here? http://www.minibikecraze.co.uk/shop/mad ... 0-10-tire/ The 4 inch wide rims open them out wider. Remember that these are bigger overall diameter, so are going to raise your chairs rear end... Unless you modify things. Not sure how well it will work out yet.